Experts who recovered remains after the 9/11 attack in New York are helping police investigators combing through debris from the Grenfell Tower fire. 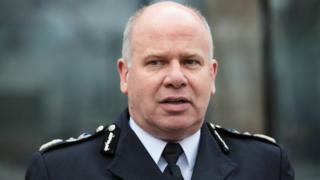 Metropolitan Police Deputy Commissioner Craig Mackey said 200 officers would be sifting through 15 tonnes of debris "until Christmas time". Police also named 68-year-old Marjorie Vital as the latest victim of the west London fire to be identified. She lived on the 19th floor with her son Ernie, who has not yet been found. Mr Mackey said the "extraordinary size of crime scene" meant the "only comparable advice" that could be found was from investigators who worked on the collapse of the World Trade Center in 2001. He added: "Without wanting to be too graphic... the fire in some parts of that building [Grenfell] burned at over 1,000 degrees for a considerable period of time. "So we are now working through, floor-by-floor, and it is literally a case of sifting and working through the debris - sadly, the remains - to try and desperately identify parts of people so we can reunite [them with their families]." The senior officer said the tower block was "one of the most complex recovery operations we've seen". About 255 people are said to have survived the blaze, which engulfed the 24-storey block in the early hours of 14 June. On Wednesday evening Kensington and Chelsea Council's newly elected leader said 68 new homes for Grenfell Tower survivors would be identified and bought within the next two weeks, and an additional 31 homes would be acquired in the next few weeks. 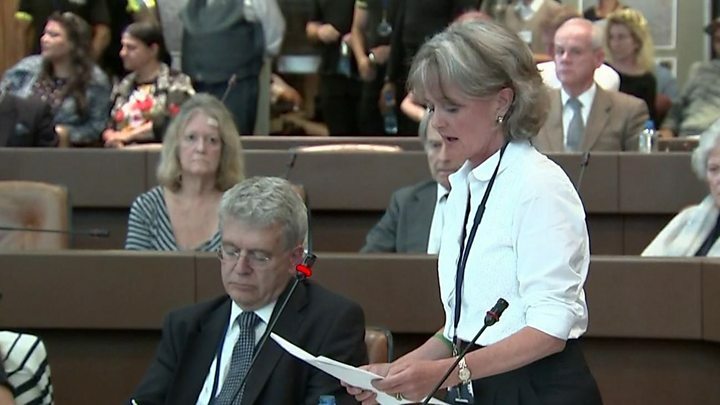 Councillor Elizabeth Campbell was booed from the public gallery in the council's first full public meeting since the tower blaze. Protesters shouted "resign" and "shame on you" as Ms Campbell was made council leader, succeeding Nicholas Paget-Brown, who resigned on 30 June. She said she was "deeply sorry" for the "grief and trauma" caused by the blaze in west London. Media captionElizabeth Campbell said she was "deeply sorry" for the "grief and trauma"
The fractious meeting ended early after a female resident fell to the ground and was attended to by medics. About 70 of the survivors attended the meeting after condemnation of the council's response. The council has been accused of being slow to react on the ground and not doing enough to rehouse Grenfell Tower residents. Many people in the public gallery at Kensington Town Hall were calling for the Conservative group that runs the council to resign and for new elections.